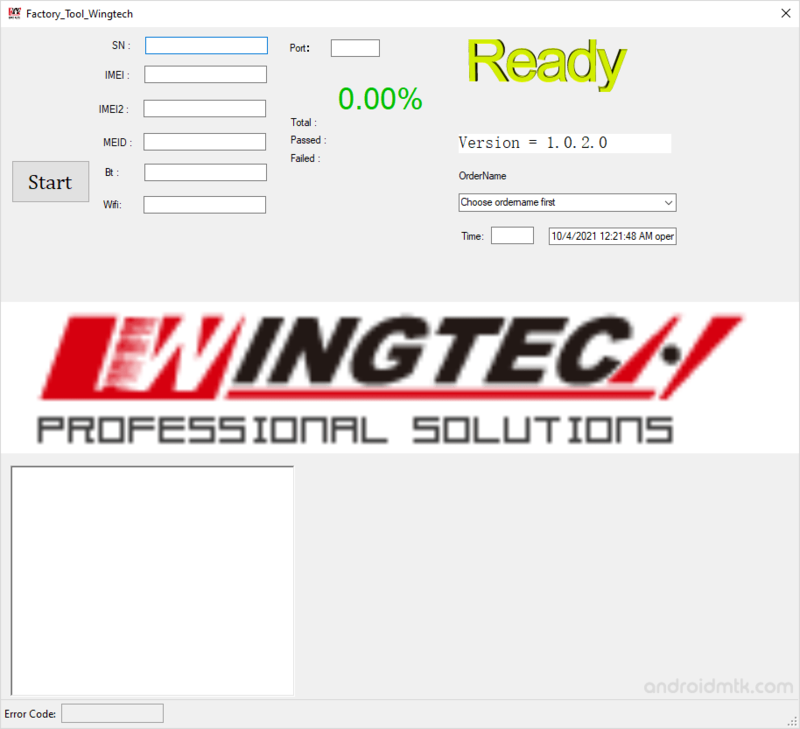 Factory Tool WingTech is a small application which allows you to Flash the IMEI on Qualcomm Smartphone and Tablets. Here, on this page, we have managed to share the latest version of Factory Tool WingTech along with the previous versions. It comes as a Portable Application, which means you dont have to install it on the computer to to use it. Simply, Download and extract the Package on your computer and you are ready to use it in no time. The overall interface is very clean and comes with all the features. It allows you to Write the SN Number, IMEI1, IMEI2, MEID, Bluetooth, WiFi number. It allows you to Flash the IMEI on Qualcomm Smartphone and Tablets. It supports Flashing of Dual IMEI at the same time. You can easily use the tool to flash Dual SIM Caard based Qualcomm Smartphone and Tablets. It also allows you to select the Port number by entering the Port ID, Choose OrderName, Order Time, Order Date. It also displays the Total Write Success, Passed and Failed Write. it also displays the Error code at the bottom of the tool. [*] Compatibility: It is compatible with the Windows XP, Windows Vista, Windows 7, Windows 8, Windows 8.1 and Windows 10 (x32 or x64 bit computer). [*] How to use Factory Tool WingTech: If you want to learn how to use Factory Tool to flash IMEI then head over to the How to Flash IMEI using Factory Tool WingTech page. [*] Caution: Take a backup of your personal data before flashing the IMEI using the Factory Tool. As your personal data may be permanently deleted after flashing the IMEI. [*] Alternative Tool: Qualcomm Smartphone Write IMEI Tool and Read&Write IMEI Tool are the best alternative to Factory Tool. [*] Credits: Factory Tool WingTech is created and distributed by WingTech Inc. So, full credits goes to them for sharing the tool for free.